Recognise this? 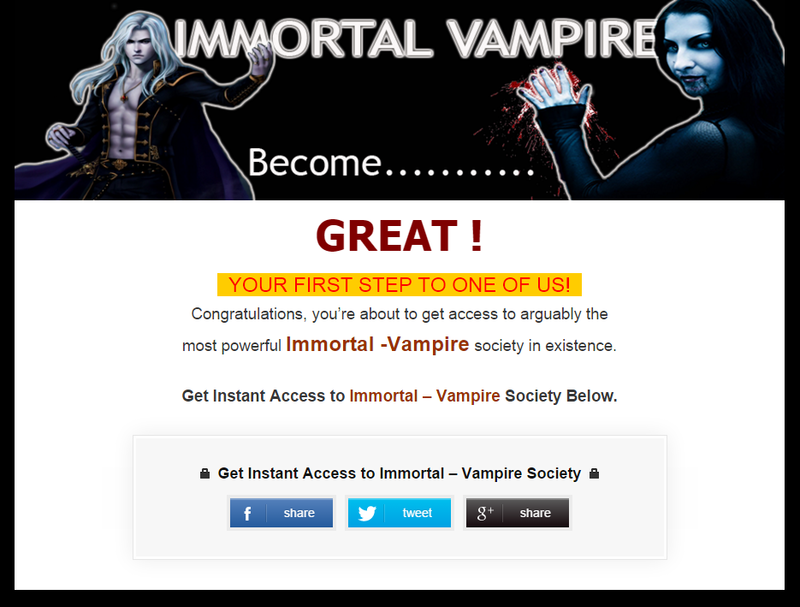 The immortalvampire.com website link shared on Facebook was accompanied by a compelling offer: “How to Become a Immortal Vampire.” Posted April 3, 2016. Picture: Anthony Hogg/Facebook. When I clicked on the link, I was taken to the site’s homepage and greeted with an offer: “Become………..One Of Us.” All I had to do was submit my first name and email address. Really that easy? Screenshot of the immortalvampire.com homepage. Picture: Immortal Vampire; archive.is. All I had to do to “Get Instant Access” was share the link on Facebook, Twitter or Google+ account. I chose Facebook. The key to immortality: Social media, apparently. Picture: Immortal Vampire. When I followed that step, the page displayed a big yellow “Get Instant Access!” button, circled in red. So close… On the cusp of receiving vampire immortality. Picture: Immortal Vampire. Immortal Vampire disclaimer. Even vampires need legal protection. Picture: Immortal Vampire. This is our terms of services section. please read carefully before proceeding further. Terms of service:- Welcome to immortalvampire.com! Thanks for using our products and services (“Services”). 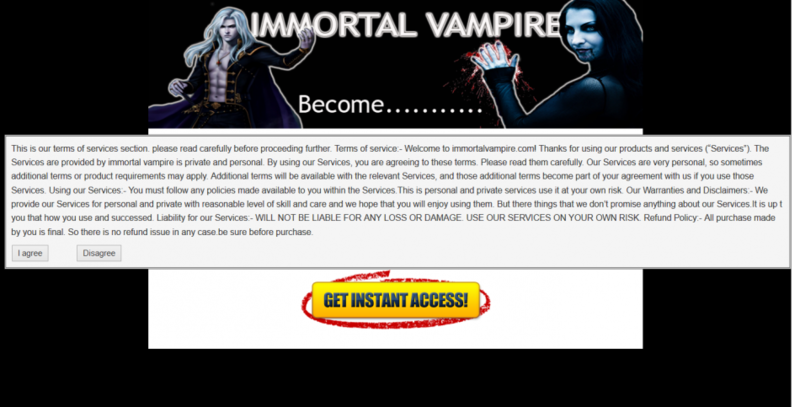 The Services are provided by immortal vampire is private and personal. By using our Services, you are agreeing to these terms. Please read them carefully. Our Services are very personal, so sometimes additional terms or product requirements may apply. Additional terms will be available with the relevant Services, and those additional terms become part of your agreement with us if you use those Services. Using our Services:- You must follow any policies made available to you within the Services.This is personal and private services use it at your own risk. Our Warranties and Disclaimers:- We provide our Services for personal and private with reasonable level of skill and care and we hope that you will enjoy using them. But there things that we don’t promise anything about our Services.It is up t you that how you use and successed. Liability for our Services:- WILL NOT BE LIABLE FOR ANY LOSS OR DAMAGE. USE OUR SERVICES ON YOUR OWN RISK. Refund Policy:- All purchase made by you is final. So there is no refund issue in any case.be sure before purchase. Just kidding. 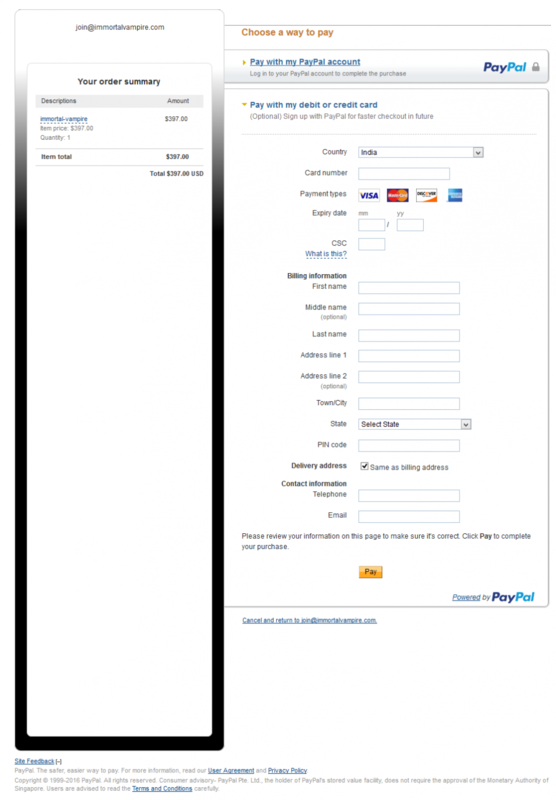 I was taken to a page asking for USD$397, payable through PayPal or debit/credit card. The high price of immortality. All yours for the low, low price of USD$397. Picture: Immortal Vampire. most powerful Immortal -Vampire clan in existence. 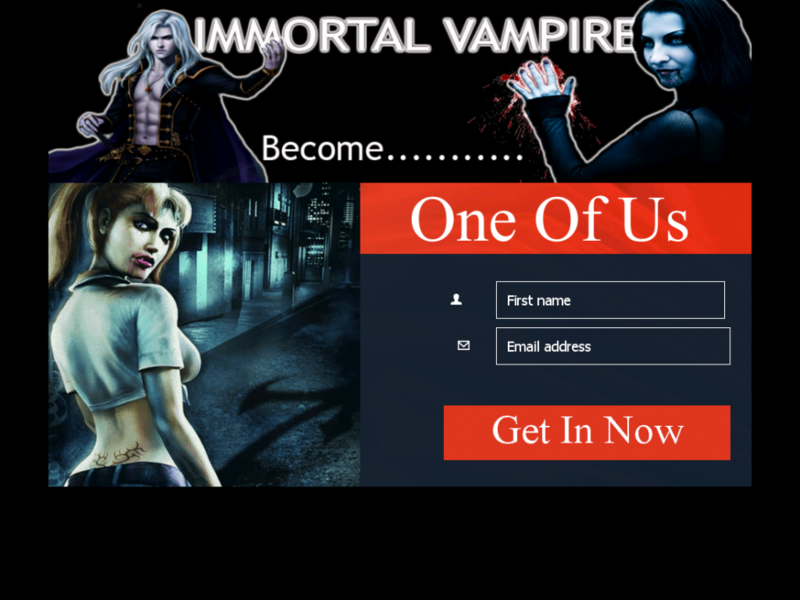 Get Instant Access to Immortal – Vampire Clan Here. so be sure to be a part of the clan Now. That seemed like a pretty exclusive deal. I asked “How many have joined so far?” As of this writing, I haven’t received a reply. But that doesn’t stop me wondering: who are these guys? Their site registration info shows no personal or corporate name; the site was registered on March 23, 2016, shortly before their links started appearing on Facebook. Although the company claims a Nobby Beach, Queensland, Australia, location—the phone number has a Danish prefix (+45): Australia’s dialing code is +61. As if that wasn’t confusing enough, I traced the message source of Immortal Vampire’s email to India. 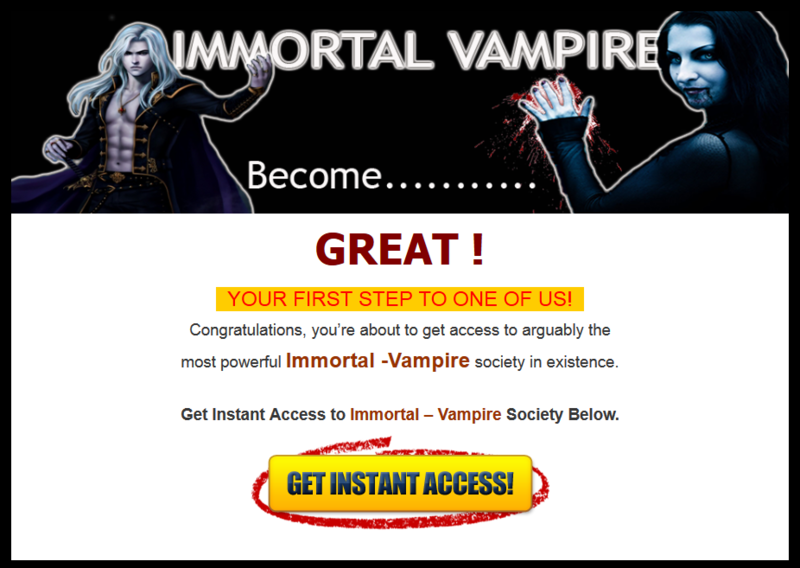 If you’re thinking Immortal Vampire’s offer sounds suspiciously like a scam, you might be right. PrivacyProtect.org’s service has been used by many scam sites, some of which have been exposed on ScamVictimsUnited.com, ScamBusters New Zealand, ScamWarners, Michael Smith News, Escrow-Fraud.com Forums and Bitcoin Forum. But those examples are just the tip of the iceberg: a reverse phone number search reveals the number is connected to over 500 domains. Grey screen of death. Let’s hope it’s cooler than a placeholder page. Picture: Immortal Vampire. 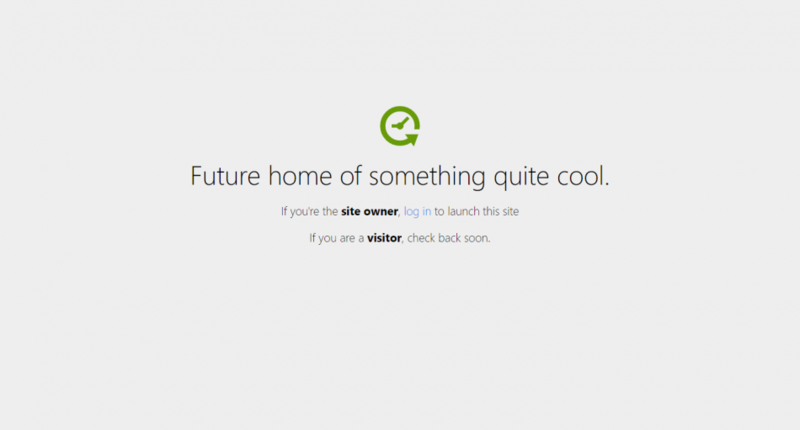 I see your site, immortalvampire.com, is no longer active. Can you tell me what you plan to do with it? Also, how many people took up your site’s offer to “Become One of Us”? I am writing about it for my website. The end of Immortal Vampire? My email to the site on August 8, 2016, was returned on the same day and marked “Undeliverable,” meaning their email address is no longer active. Picture: Outlook. I sent them an email the same day: Anthony Hogg, email message to join@immortalvampire.com, April 3, 2016. 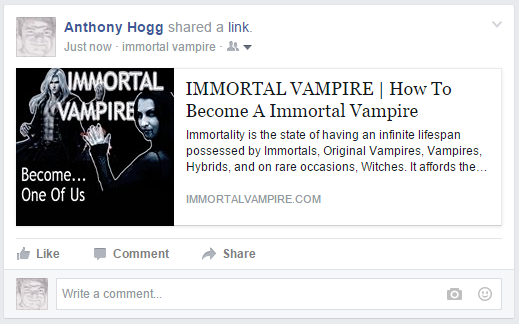 Then, I got this: join@immortalvampire.com, email message to Anthony Hogg, April 7, 2016. “How many have joined so far?”: Anthony Hogg, email message to join@immortalvampire.com, April 7, 2016.
site registration info: DomainTools, “Whois Record for ImmortalVampire.com,” DomainTools, 2016, accessed April 3, 2016, http://whois.domaintools.com/immortalvampire.com. archive.is link: https://archive.is/44eJs. ImmortalVampire.com was registered through publicdomainregistry.com and the registrar’s identity hidden via PrivacyProtect.org’s service. a website which: PrivacyProtect.org, “About Privacy Protect,” Privacy Protect, 2016, accessed April 22, 2016, http://privacyprotect.org/about-privacyprotection/. archive.is link: https://archive.is/XWFPL. ScamVictimsUnited.com: “Electronic Websites,” ScamVictimsUnited.com, 2008, accessed April 3, 2016, http://scamvictimsunited.com/phpBB2/viewtopic.php?f=30&t=3012. archive.is link: https://archive.is/ED2DP. Escrow-Fraud.com Forums: “Need to Know If This Is Fraudulent?,” Escrow-Fraud.com Forums, 2012, accessed April 3, 2016, http://forum.escrow-fraud.com/viewtopic.php?f=1&t=3017. archive.is link: https://archive.is/OatxH. ScamBusters New Zealand: “Privacy for Spammers & Other Malcontents,” ScamBusters New Zealand, 2013, accessed April 3, 2016, http://www.scambusters.co.nz/forum/viewtopic.php?t=6308. archive.is link: https://archive.is/mS1YW. ScamWarners: “Xp-sE.com Express Postal Services,” ScamWarners, 2013, accessed April 3, 2016, https://www.scamwarners.com/forum/viewtopic.php?f=34&t=66126. archive.is link: https://archive.is/TwgoN. Bitcoin Forum: “Bitcoin Arbitrage Method (6%),” Bitcoin Forum, 2014, accessed April 3, 2016, https://bitcointalk.org/index.php?topic=636638.0. archive.is link: https://archive.is/F583p. Michael Smith News.com: Michael Smith, “The Muslim Brotherhood in Australia?” Michael Smith News.com (blog), January 12, 2015, accessed April 3, 2016, http://www.michaelsmithnews.com/2015/01/the-muslim-brotherhood-in-australia.html. archive.is link: https://archive.is/VJ4dO. a reverse phone number search: snoop.io, “+45.36946676 Reverse Phone Lookup,” snoop.io, n.d., accessed April 3, 2016, http://snoop.io/phone/%2B45.36946676. archive.is link: https://archive.is/efPx1. If you visit the Immortal Vampire website today: immortalvampire.com, , accessed August 8, 2016, http://immortalvampire.com/. archive.is link: http://archive.is/uVIaN. “Good evening”: Anthony Hogg, email message to join@immortalvampire.com, August 8, 2016. 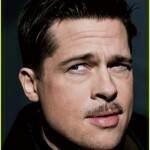 I’d like to thank Becka Wood for drawing my attention to immortalvampire.com. You can visit Becka’s website, the Vampire Learning Centre, here: https://vampirelearningcentre.wordpress.com/. I’d also like to thank Erin Chapman for providing the ScamVictimsUnited.com lead; that link opened the door to the other scam examples I sought out and listed for this article. Next article Strigoi! Did Arthur Conan Doyle Really Know Bram Stoker? Hello world Am Jerry by name, i turn to a vampire any time i want to. i become a vampire because of how people treat me, at the snack of my finger things are made possible. am now a powerful man and no one step on me without an apology . i turn to human being also at any time i want to. and am one of the most dreaded man in my country. i become a vampire through the help of my friend who introduce me into a vampire hood by given me their email. Don’t spam my site with nonsense, please. i want to inform you that out there people are claiming to be vampire and they turn out to be fake that how i payed them lot of money at the end it was fake.thank God i found the real vampire,who turn me into vampire within one week and his name is morrisonandason and you can contact him email:morrisonandason@yahoo.com. I’d put good money on you being fake, too. Indeed, you just spoke about yourself in third person. My name is Diana, I’m from New Jersey, I want to share my testimony on how I became a Original vampire. Yes, I always wanted to become a vampire because it has always been my desire to be one. And I search links and websites, I even took the risk and search on the dark web, and I find a link of that say’s ‘Become a newborn twilight vampire’ that was pretty interesting right, I click on the link that redirects me to website which I got their email address. that moment in my life was like a dream come true, There I finally get learn more about it as well, and it was all amazing to me. I contacted them and I get instant responses, I followed the terms. I gave a try and it really works out for me, today I’m living testimony, Contact via email: volkov73@reborn.com, (also contact to become Twilight Vampire, Vampire ) in a space 3 days, I got a vampire blood which sends to me via courier, gives a try and share your own testimony.. thanks and good luck. If you’re going to try and con people, you might want to use the same email address you used to submit your comment. Ta. You can write to me there and I will share more information with you. Strigoi! Did Arthur Conan Doyle Really Know Bram Stoker?